Volunteers are encouraged to head activities like games, storytelling, arts/crafts etc. Our main criteria: You can't find it at a psychic fair. Group participation is the key. MUSIC: The venue does not allow live music, so no drumming/instruments. You can bring a CD player for dance activities, but one with batteries as I don't think the pavilion has electricity. Here are some suggestions for activities anyone can lead. It's not limited to just these categories. 1. Team activities: Something that encourages movement. It can be for kids, adults or both! Dodgeball, frisbee, competitive jump-roping... the field's pretty open. What do you like to do at a picnic? 2. 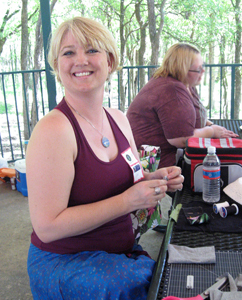 Arts/crafts: Picnic tables are reserved for food and conversation, so please bring your own table or blanket. Supplies need to be something easily cleaned up afterwards. Volunteers are responsible for their area. If you are going to do an activity that needs a table and/or a cover, please bring your own for use outside the pavilion area. You are responsible for setup, tear-down and cleanup. ﻿3. Teach us something: Do you know how to hula-hoop, do a Spiral Dance, etc? Share your talents and teach others something new that they can enjoy together. 4. Storytelling: Pagan folklore, a personal spiritual experience - Pagans like to talk, so here's a chance to have an audience! Please have it memorized; no reading of written material. Really get into the storytelling experience and make us feel like we're there with you.